BOSTON - Junior Paige Capistran notched her first collegiate two-goal game to help the No. 6 Northeastern women's hockey team (10-1-1, 9-0-1 WHEA) complete a late comeback for its ninth straight win, 5-3 over New Hampshire (1-9-2, 1-8-1 WHEA) on Saturday at Matthews Arena. 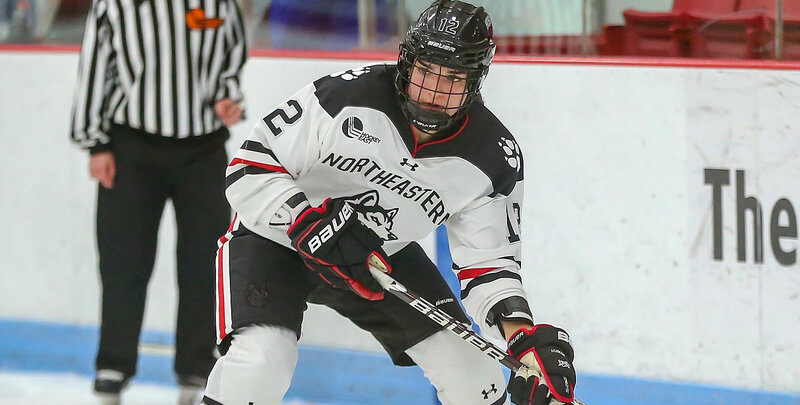 The Huskies trailed 3-2 with less than five minutes remaining in the game, before a three-goal flurry flipped the script in Northeastern's favor. Senior Kasidy Anderson tied the game with a power-play goal at 15:16, redirecting an Alina Mueller point-shot past UNH netminder Kyra Smith (35 saves). Capistran then put Northeastern ahead for good with a seeing-eye shot through traffic from between the circles at 17:26, before sophomore Tessa Ward salted the game away with an empty-netter at 19:57. Freshman Chloe Aurard led the Huskies with four assists to become the first NU player since Teresa Ella in 2003 to earn four helpers in a game. Rookie Alina Mueller added a goal and two assists to push her point-streak to 11 straight games, and Anderson also tacked on a three-point effort with two assists to go with her game-tying goal. Both teams scored twice in the opening period, setting the tone for a wild afternoon at Matthews Arena. Mueller broke through first, shifting forehand to backhand in the low slot after a great defensive play and pass by Aurard to set up the goal. After the Wildcats scored twice to go ahead 2-1, Capistran leveled the score at 16:55 of the first period with a shot that deflected home off the leg of a UNH defender. The Wildcats re-took the lead at 3-2 in the second period with a power-play goal from Meghara McManus, but the visitors could not make the advantage stand up as Northeastern rallied late to earn its 21st win in 24 tries vs. UNH. Senior Brittany Bugalski made 20 saves to improve to 5-0-1 on the year. The victory was the 55th in Bugalski's collegiate career, which ties her for third all-time at NU in career wins. The Huskies are back in action next weekend at Maine for a pair of games, beginning Friday at 6 p.m.